On the first Sunday of every new year, Tohkon Judo Academy (4427 North Clark) meets at Montrose Beach for Kangeiko Training. At 6:45am. Kangeiko is a winter training practice that traditionally occurs early mornings, in dead winter, to foster mental toughness. Tohkon’s includes a run along the lakefront, races up and down Cricket Hill, and calisthenics in an open field and on playground equipment. Cold, ice, snow, or not. Judoka (practitioners) and their families relay race, piggyback, and otherwise grapple with each other in a community event as if from a movie. These play exercises demonstrate that we can carry each other further than you might imagine, and that the force we put on each other, and ourselves, is enough to make you better, faster, stronger. This winter I joined Tohkon for their famed run, with my middle-school-aged son who has been practicing judo now for years. Yes it was early, yes it was cold, and yes, it was challenging. But it was also the most invigorating, familial group activity I had engaged in since egg tosses and sack races some thirty years ago at the Yamanashi Prefecture picnics which my father took me to. Mid-sweat that frigid morning I realized how much I missed those warm times and fraternity, but more so how much I need it now. The Lakeview Japanese American (JA) community I grew up amid dwindled over the seventies, eighties and nineties. Some 20,000 Japanese Americans resettled in Chicago after WWII and established many successful small businesses including restaurants, dry cleaners and curio shops. Gone now are the JA Boy Scouts at the Buddhist Temple of Chicago in Uptown, JA bowling leagues at Marigold Bowl, Star Market (sushi fish, seaweed, varieties of rice vinegar, and Japanese candies of course! ), Toguri Mercantile Exchange (Japanese books in translation, clothing, cooking supplies, serveware, and toys), and JA people in general. Many of the lost, and few still operating, JA businesses and cultural places are being documented by Erik Matsunaga in his “Thirty Years of Lakeview: Chicago’s Japanese American Community 1960s–1990s.” The gap is staggering. By the millennium, a great number of JA people had already moved to Arlington Heights, where the Chicago Futabakai Japanese School and Mitsuwa Marketplace, a Japanese-owned shopping center founded in the early seventies, are located. It is also near Hoffman Estates and Schaumburg, where many Japanese companies have US headquarters. Matsunaga is effectively preserving what was the closest thing to Japantown Chicago ever had, and the call is out for surviving stories. The reasons why Chicago never had a Japantown are many, including strictures placed on Japanese Americans during and after WWII, Japanese easy and eager assimilation, and, consequently, their joining whites in flight from a racially transitioning city. By the nineties there was a dearth of meeting places for the JA community, just as young Doug Tono and Larry Wiley, Japanese Americans native to Chicago, started the Tohkon Judo Academy in a small facility on the West Side. Tohkon translates to “fighting spirit” and judo itself means “gentle way,” which go hand in hand with my experience of the rigor and kindness of its instructors, training staff and students. The aim of judo is to make the body strong, useful and healthy while building character through mental and moral discipline. Aside from sport, Tohkon’s explicit mission is to bring people of diverse socioeconomic backgrounds together and to teach young members to have a sense of priority, self-discipline and self-esteem. The dojo quickly outgrew its modest space and in 1995 partnered with the Japanese American Service Committee (JASC) which has endured as a stalwart cultural office since postwar relocation. The JASC fronted money for initial expenses, which was to be reimbursed in rent and labor. True to its name, Tohkon built the dojo by hand, which is documented in a series of snapshots on the dojo walls. 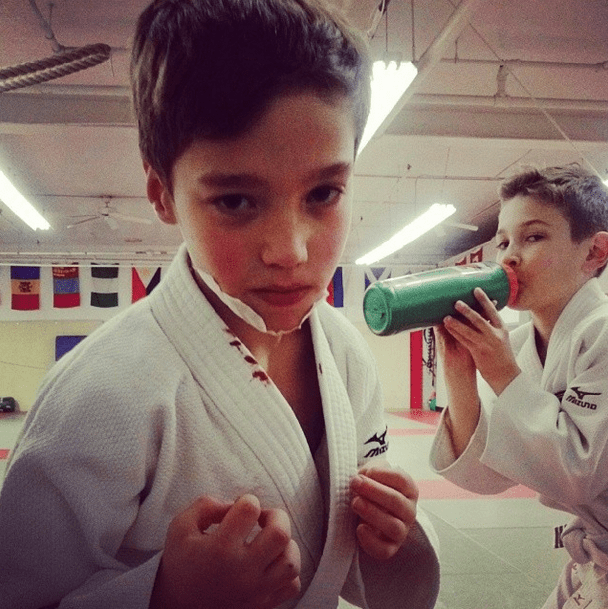 Tohkon remains at the North Side’s JASC and has quadrupled in size, becoming the largest judo dojo in the Midwest, and among the top five in the country. There are more than 180 members from over thirty countries in all of its programs combined, including juniors (under fourteen years old), seniors, women’s and kata (choreographed demonstration) as well as programs in Chicago Public Schools for the visually impaired, physically handicapped, and “at-risk” youth. With more than fifty black belts, Tohkon has one of the largest black belt memberships in the country. Fees are astonishingly low at $75 for an annual membership and an additional $50 per month for kids and $55 for adults, which entitles students to up to three sessions per week (for a total of sixteen hours per month). Nevertheless, Tohkon has awarded many scholarships to students who need financial assistance. To boot, judo is just one of the many opportunities for community thanks to the alliance with the JASC. There are frequent gatherings and seasonal celebrations, cookouts and picnics which are free and open to the public. I can personally attest to that sentiment, having sat at the Tohkon family table after our New Year’s Kangeiko Training. Our early morning trial was followed by a family-style meal at the “cheery Filipino eatery,” Merla’s Kitchen (5207 North Kimball). We shared the healthiest breakfast… of the year. Mounds of bacon, longanisa sausage and rice, toasted buns, fried eggs, coffee and orange juice. Many red-faced men, women and children basked near space heaters, in wet sweats, after vigorous exercise with a heart full of fight and gentleness.